The testo 330-1G LL, is combustion analysis without confusion. Redesigned with a full color graphic display, the 330-1G LL combustion analyzer allows the user to visualize the measurement data graphically without watching numerical values. Self-explanatory graphic curves, easy-to-understand symbols and a clear color display ease the understanding of the measurement data considerably. This allows users to know exactly where they are at and shows a trend line of where they are heading during the adjustment process. Thumb symbols instantly confirm the system status of O2 and CO concentrations in the green zone (safe & efficient) confirming operation falls within the manufacturer’s guidelines. 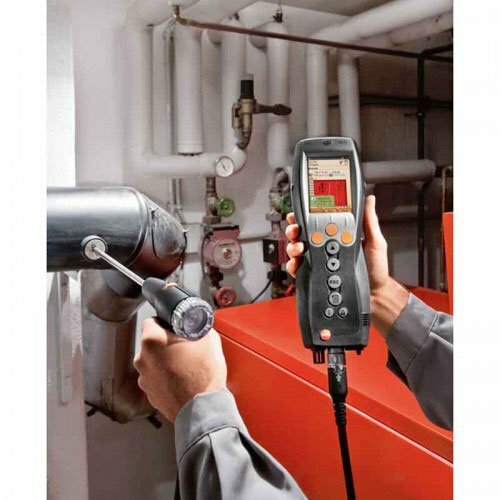 The Testo 330-2G LL combustion analyzer offers combustion analysis in colorful charts and graphics for faster and easier troubleshooting, set-up and optimization of light industrial and commercial heating systems. With the 330-2G LL you set the parameters and watch real time results on the display in either standard “line” view or graphic view during tuning adjustments.